Stunning as always! Love it! Oh my the curved sentiment is FANTASTIC!!! So glad you played along with us in this week's CAS(E) this Sketch! Love your sentiment that is the butterflies trail! Great black and white with a splash of color! 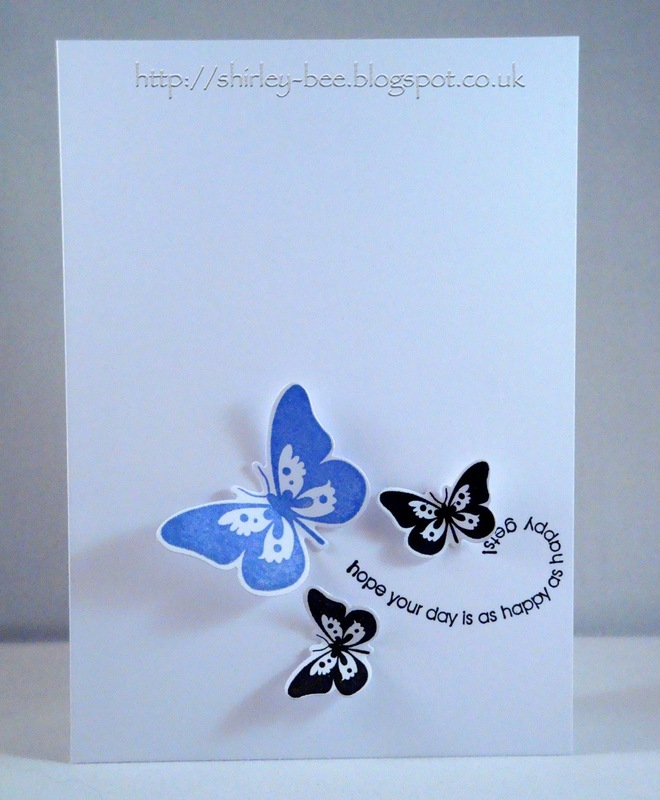 What a perfect butterfly tail that sentiment is, Shirley! I don't remember seeing that one. Sigh. My Wish Binder is awfully heavy for January. A lot of that is your fault, you know, you and your Brilliant Cards!! Wow - great job matching this sentiment with the butterflies! Fabulous stamp/die set and gorgeous colors! Love this to bits! What a WONDERFULLY creative use of this sketch!! LOVE the words in the butterfly trail! So glad to see you at CAS(E) this Sketch! This is a clever take on the sketch - love the curvy sentiment and the dimension on the butterflies! Thanks so much for playing along with CAS(E) This Sketch this week, Shirley! Love how you used the senitment and pop of butterflies. Clever take on the sketch.Thanks for playing along with us @ CAS(E) this Sketch! Love the movement in this card, those butterflies are fantastic :) Thanks for playing this week at CAS(E) this Sketch!